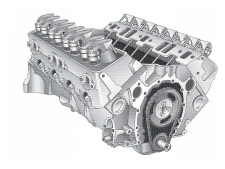 70-80 4.1L (250 CID) inline 6 cylinder remanufactured long block GM engine. Standard rotation and does not include tinware (timing cover and oil pan.) Casting numbers 855, 675, 127, 466, 575. All engines returned with freeze crack, salt water and connecting rod blowouts will receive 1/2 core value. Store Hours: 8 a.m. to 5:30 p.m. CST Monday through Friday. *Tin Ware includes timing cover and oil pan already installed. Cores must be paid in full at the time of sale. All 4-cylinder and 454 engines require a core return. All cores must be shipped prepaid unless pre-arranged with FirstMate Marine. Deduction will be assessed for missing parts and damaged blocks. All 454 cores will be given full core credit when core has been returned. FirstMate Marine, at their expense, will arrange pickup on all 454 cores. Call 1-800-437-1779 for core shipping instructions. FirstMate Marine recommends priming all engines with a pressure pre-oiler. Please inspect all engines before signing the freight bill. If there is freight damage, we need to start a claim with the freight line.